Beeson, Mark, “The United States and East Asia: The Decline of Long-Distance Leadership?” The Asia-Pacific Journal, no. 43, 2009. Available at http://www.japanfocus.org/-mark-beeson/3240 (accessed on April 30, 2014). Campbell, Kurt M. and Willow Darsie (eds), “China Marches on the 21st Century,” A Report of the Aspen Study Group, The Aspen Institute, 2007. Available at http://www.aspeninstitute.org/sites/default/files/content/docs/asg/CMTCFINAL052307.PDF (accessed on April 30, 2014). Chang, Gordon, “Hillary Clinton Changes America’s China Policy: The Secretary of State Pulls a 180 on Beijing,” Forbes, July 28, 2010. Available at http://www.forbes.com/2010/07/28/china-beijing-asia-hillary-clinton-opinions-columnists-gordon-g-chang.html (accessed on April 30, 2014). —, “America’s Pacific Century, “Foreign Policy, November 2011. Available at www.foreignpolicy.com/articles/2011/10/11/americas_pacific_century (accessed on April 30, 2014). Feigenbaum, Evan, “India’s Rise, America’s Interest: The Fate of the US-India partnership,” Foreign Affairs, March/April 2010. Available at http://www.foreignaffairs.com/articles/65995/evan-a-feigenbaum/indias-rise-americas-interest (accessed on April 30, 2014). Greenert, Jonathan, “The Navy Pivots to Asia,” Foreign Policy, November 14, 2012. Available at http://www.foreignpolicy.com/articles/2012/11/14/sea_change (accessed on April 30, 2014). National Security Council Paper NSC-68 of April 7, 1950. Available at http://history.state.gov/milestones/1945–1952/NSC68 (accessed on April 30, 2014). Nye, Joseph, “The Future of American Power,” Foreign Affairs, November/December issue, 2010. Available at http://www.foreignaffairs.com/articles/66796/joseph-s-nye-jr/the-future-of-american-power (accessed on April 4, 2014). Subcommittee on Asia and the Pacific, February 5, 2014. Available at http://www.state.gov/p/eap/rls/rm/2014/02/221293.htm. (accessed on April 30, 2014). Swaine, Michael and M. Taylor Fravel, “China’s Assertive Behavior: Part Two: the Maritime Periphery,” China Leadership Monitor, vol. 35, Summer 2011, Hoover Institute, Stanford University. 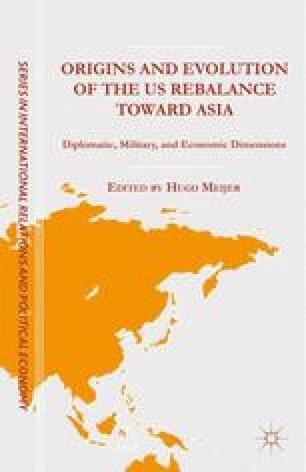 Available at http://www.hoover.org/publications/china-leadership-monitor/8146 (accessed on April 30, 2014). Swartz, Norton and Jonathan Greenert, “Air-Sea Battle: Promoting Stability in an Era of Uncertainty,” The American Interest, February 2012. Available at http://www.the-american-interest.com/article.cfm?piece=1212 (accessed on April 30, 2014). US Department of Defense, Annual Report to Congress [on] Military and Security Developments Involving the People’s Republic of China 2011, Washington. Available at http://www.defense.gov/pubs/pdfs/2011_cmpr_final.pdf (accessed on April 30, 2014). —, Sustaining U.S. Global Leaderships: Priorities for the 21st Century. Available at http://www.defense.gov/news/Defense_Strategic_Guidance.pdf (accessed on April 30, 2014). Wihardja, Maria Monica, “2011 East Asia Summit: New Members, Challenges and Opportunities,” East Asia Forum: Economics, Politics and Public Policy in East Asia and the Pacific, June 1, 2011. Available at http://www.eastasiaforum.org/2011/06/01/2011-east-asia-summit-new-members-challenges-and-opportunities./ (accessed on April 30, 2014).